Sandstone Planter & Pots | American Made Yard Pottery | Unique Styles | Ship Nationwide. One of our most decorative & beautiful sandstone garden planters. The Cardiff vase has so many decorative touches. From the large rolled rings surrounding the body to the draped ribbon swags and bows. The attention to detail is amazing. 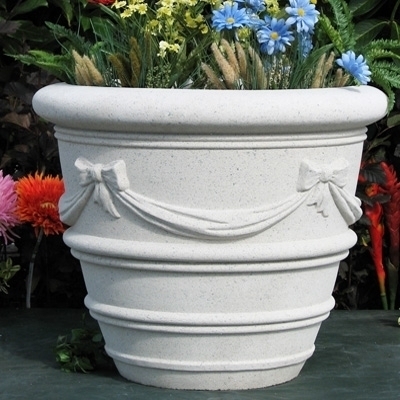 Formed into a traditional tapered flowerpot shape, these wonderful details take this planter to a whole new level. Perfect for a traditional or European landscape project. From small to large our Cardiff vase will hold colorful flowers, shrubs, palms or trees. These reconstituted stone containers are hand cast using a dry mix technique that incorporates concrete. Smooth, velvety finish and texture - these planters are truly a piece of art as well as a functioning piece of garden pottery. Used in Europe for centuries, dry cast stone has proven itself to be durable and high-quality pottery. Manufactured by Nichols Bros Stoneworks you know you are getting quality garden pottery, containers & planters using the finest materials & high-quality workmanship. NVC16 $58.00 16.00" 8.00" 12.50"
NVC20 $98.00 20.00" 10.00" 16.50"
NVC24 $202.00 24.00" 12.00" 19.00"
NVC30 $350.00 30.00" 15.00" 23.50"